Kristabella: Full of Snark Since 1977 » Are They Meant For……Sitting? They are doing some major streetscape work on a street that I walk on to get to the train every day. It is the very stupidest thing the City has ever done. It made a really busy east-west street two lanes instead of four. 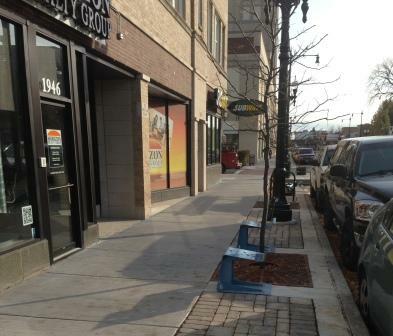 And all of it was done for a wider sidewalk with some bricks and some new trees. Couple that with the fact that it is near a major train station and they just built a grocery store, gym and tons of apartments, and this seem even stupider. But then each day it just gets more bizarre. First it was when they tore up the concrete that they had just put down a few days prior (I wonder why the City is so broke??). 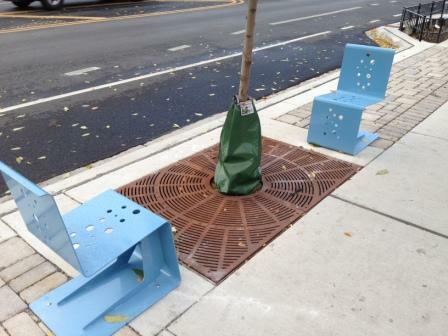 Now it is that they are adding some street furniture that I’m not really sure is supposed to be furniture. Up and down the street, at very random intervals, are these blue chairs. Which, that’s a nice addition, especially since there is a bus route on this street. But, none of these chairs are by a bus stop. And on top of that, they don’t even all face the same way. These lovely chairs point directly into the front windows of a realty group. That’s got to be weird to be sitting in the conference room and have people sitting, staring at you from the street. Is it, some sort of weird social experiment? Performance art? Are these there for those random times you need to have a discussion AROUND A TREE? Is it some kind of art? Are we being punked? I need someone to explain why my tax dollars went to this!